How are you coming along with selecting something to read for your reading project? If you are have a hard time deciding, pick something short. Then you can try something different next time. If reading in English is hard for you, then you should focus on reading shorter pieces until reading gets easier. Wearing yourself out mentally won't help. With that thought in mind, maybe I should look for "Flash Fiction" links. Flash fiction stories are very short. Changing the subject, New Years is coming. I'm looking for a New Years writing assignment. Not everyone in the class celebrates Christmas, most every culture has some kind of festival for the New Year and new beginning - or end of the old year. Should we write New Year's Resolutions? Many write them: few keep them. What else would be suitable writing for the season? We could write out lists of the best and worst of 2007. Or we could make predictions for 2008. Hopes and wishes - we need those. Let me know what interests you - or jump right in and write something about New Years and what it means. I have a piece of news for you: I will be doing part of the EFI workshop at the 2008 TESOL Electronic Village. My topic will be managing the email based online class and using blogs. I set up a blog for the workshop and hope that some of you will decide to join me. I would really like to see you join me there and welcome your comments and suggestions. I picked this graphic of a cowboy carrying an xmas tree in front of his saddle because I live in a western state where cowboys and ranching are part of local tradition. Do you have seasonal greetings, blessings, good wishes, etc. (denomination of your choice) to share? Write them up - gift wrap with colors, fonts, quotes, links - whatever strikes your fancy and blog them. Your greetings do not have to be about Christmas. You can write about a holiday that you celebrate this time of year in your country. Or you can write about how Christmas and New Years are celebrated in a non-English speaking country. 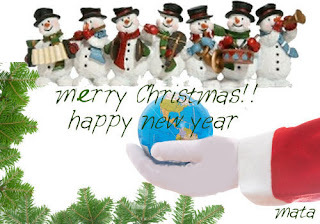 Sing-A-Long Christmas Carols - Midi music & lyrics. Just click on any of the Christmas Carols to Sing-A-Long. Hello Ms Vanessa and all of you. I have a serious problem with my computer the last few weeks. It works very slowly; it doesn’t open internet’s pages. Each day became more and more badly. So I decided to do format. Just now I began to work on my computer. I believe that it works well. We’ll see.. I make for you a Christmas card and I wish happy holidays and Marry Christmas! !I‘ll write you soon how it was my Christmas days. More resources to help you with your DAILY LISTENING PRONUNCIATION STUDY and PRACTICE. The rest is up to you. Downloads for listening and reading: Develop your English listening and reading skills using MP3 audio files and audio scripts. You can listen to the files online, or download them onto your PC and put them on your MP3 player, then see if you've understood by reading the scripts. You can also read the stories online as you listen, and then do language activities, or print out the audio scripts and read the stories on paper as you listen. Read whatever you wish so long as it is in English and not translated from another language into English. Give a source (title, author, publishing information and date) and a very brief summary in a couple of sentences - really just an explanation of the topic. ("This story or article is about...") The main part of your report is your reaction to what you have read. Before reporting, post telling the class what you are going to read. Let me know if you need help finding something online to read. 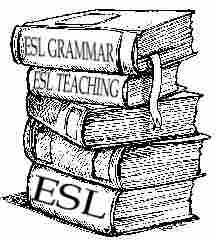 What did you think of the reading - quality of writing, ease or difficulty of reading? What did you like (or dislike) most about the reading? Would you read more by the same writer or on the same topic? Would you recommend the story, article or novel? Include any reservations you might have about who would enjoy reading it. Describe a passage or section that made an impression on you. If this were a credit course, I would give 5 points news articles and other short texts, double for short stories or longer articles and quadruple points for a novel. Because discussing readings is always an important part of any class with readings, I would give 3 points for substantive comments (150-200 words) responding to someone else' report, with bonus points for comments showing serious thought rather than just repeating platitudes and cliches. After work,my first thing is study English.It is form habit to me.I feel it is very happy . Through learn English ,I get lots of knowledge from kinds of area. For example,every evening I read the website www.bbc.com . on the website ,including news,art,culture and so on. When read these , I feel happy and substantial. I am prepareing for the ielts exam.I have confidentce in passing it.Please wait for my good news. My apologies for being quiet and not checking in sooner. I am in the middle of an online training course. I will be teaching college writing classes online, so I have to take the college's online teacher training certification. The class is intensive and takes both time and attention. However. I won't be teaching full time and will still be able to keep up with this class. Besides, it will be interesting to share what the other classes are doing and compare notes. For now, you might enjoy reading about my being a student with homework - weekly assignments to write and post in the online classroom. In addition to assigned reading and 4-5 written assignments each week, I also have post "substantive" replies to other students' posts. As you already know, that is how class discussion works in an online class. There are no "lectures." Instead, we have readings. All study materials and readings are available on the college web site - the OLS or Online Learning System, which also includes library, a writing center, online tutorials, forums, email and more. Answers to discussion questions need to be at least 200 words, which is also what we will expect from students in our classes. "Substantive" replies add to the discussion, expanding on and developing the topic. Just posting "great post" or "I agree" does not count as a "substantive reply. In addition to written discussion, we have "exercises" or longer writing assignments on the course materials and assigned readings that we post to an individual forum that only the instructor or facilitator can read - besides the individual student of course. Are any of you thinking about taking an online course for credit or certification someday? Online education and training is a major growth area. I have mixed feelings about the trend. The online education system is not perfect and has problems, it does make education available to more people. Let's discuss this. What do you think is the future of education in today's world? Of online education for degrees and certification?